It’s been seven months since I returned home to Revelstoke from my bike trip to South America. 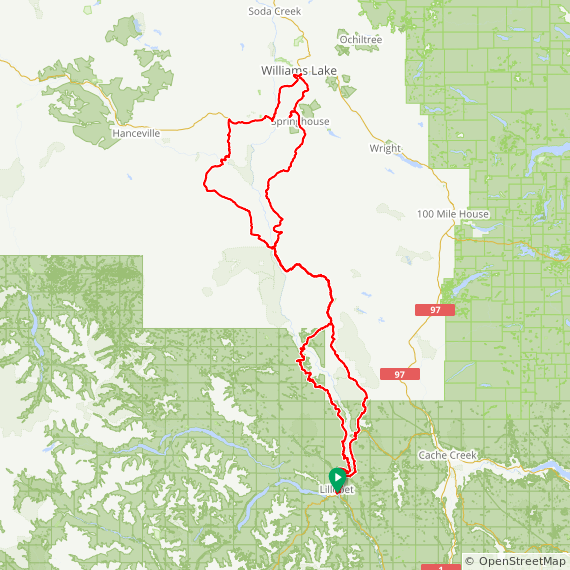 In that time, I enjoyed the end of ski season, did a lot of mountain biking, and went on one weekend bike tour to the Kootenays. I worked at a provincial park campground for the summer, spent a few weeks in September building a fence, then enjoyed a visit from my parents for the first week of October. It’s been great being back, but at the same time, wanderlust had crept in. With a sunny skies and time off in the forecast, I decided to get in one last bike tour before winter. I thought about heading south to Utah with my touring bike and mountain bike and riding around the desert. I looked at a trip to Vancouver Island and the Sunshine Coast – a part of B.C. I haven’t really explored. I contemplated a loop around the Gold Range that would start and end at my door in Revelstoke, but a big snow storm in early October meant that likely wouldn’t be much fun – especially the mandatory hike-a-bike bushwhack through a mountain pass. Then, I set my eyes on another part of B.C. I’d never seen – the Fraser River valley between Lillooet and William’s Lake. I knew it was home to a deep canyon and big ranches, but that was about it. I’d seen a mountain bike movie called Follow the Fraser that filmed in this region and it looked pretty spectacular. I studied the maps online and saw there were roads that would take me as close to the river as possible, linking up a few remote crossings in the region. I would follow the old gold rush trail and pass through some historic ranches on the way to William’s Lake, and then make my way back. Most of the information I found about the route came from motorcyclists, but I did find a couple of blogs from pedal-powered types like me. The route, on paper at least. My only concern was the same storm that hit Revelstoke also hit over there and the snow situation was a question mark. The route would climb over 1,200 metres elevation, and I didn’t know what to expect. I spent the days leading up to it studying the weather and looking at nearby highway cameras to watch the snow melt. One camera had a snow plot attached and it showed the snow level melting from 12 centimetres to less than five. That’s when I knew I was good to go. I set out on the Tuesday after Thansgiving. I left Revelstoke a little later than planned and didn’t get to Lillooet until after 3 p.m. I parked my car at the Reynolds Hotel, where an employee warned me about the remoteness of the region I was going to enter. There would be no cell reception, very few people, and no help should anything go awry, he advised, and I would also encounter snow at some point. I’m prepared for anything, I replied cockily, my main fear being a bear wandering into my tent at night. With that, I left town heading north on the highway towards Gold Bridge before peeling off on the dirt West Pavillion Road. My destination was the Big Bar Ferry, 90 kilometres and a lot of climbing away. The road was carved into the side of the mountains, overhanging the Fraser River with views of the ranches on the other side. I pedaled for two hours until I finally found a flat spot just off the road to pitch my tent and hunker down for the night. I had a rough sleep but when I finally woke up it was almost 8 a.m. It took me more than an hour to get packed up and when I finally got going I had a nice long cruise downhill to start the day. Then the climbing began. Passing by one ranch, I was stopped by a worker cruising around on an ATV, checking to see if any damage had been done while he’d been gone the last few days. Dave was an English literature and film student long ago before getting into carpentry. He’d moved out here to work on a project and wound up working on the ranch for the summer. He noted my GoPro and we philosophized about the prevalence of social media (guilty!). And he warned me about the road ahead, as did a tourist who’d backtracked in his SUV after encountering thick mud. I knew this would be a hard day but it ended up being even worse than expected. My route showed a series of small climbs, short descents, a big climb, long descent, then an even bigger climb and a longer descent to the Big Bar Ferry, which I hoped to reach that day. It was overcast and I pedaled through several big ranches before veering away from the river and into the forest. After a few hours I all but left people behind and was on my own. At around the 50K mark I passed a hunting camp and close to 60K I encountered two people in a big truck who said they were turned around by thick mud a few kilometres on. The road was already slick and the mud was starting to coat my bike. I wasn’t looking forward to what was up ahead. As I neared the top of the first big climb I saw more and more snow along the road and hit thick mud where tire trucks had cleared away the snow. I was grateful for the beefy front tire I had just put on my bike. I reached the top relatively unscathed and cruised down the other side, mud splattering in my face until I reached drier elevations. I was greeted with more views of the Fraser valley as I made my way down to Watson Bar Creek, where I bottomed out 700 metres below where I started, and 700 metres below the top of my final climb. By this point, a thick layer of mud had coated both tires, making the going slow and miserable. Snow and mud: the worst combo. That moment when you’re going down and you can see the next climb across the valley is never encouraging. Looking back at a remote ranch on the west side of the Fraser River. That next climb was a brute. It started off fairly gentle but eventually the thick mud got the best of me. It’s one thing to grind your way uphill. It’s another to do so with a pound or so of mud on each tire. I would wipe it off only for it to cake back on within minutes. My goal of reaching the Big Bar Ferry seemed out of reach when a pair of hunters stopped and offered me a ride to the top. I was beyond the point of pride and gladly accepted. They were hunting sheep, without much luck. I told them I’d seen lots of ungulate tracks and bear poop, but no animals other than one fox. These guys gave me a ride. Unfortunately I forgot their names. They dropped me off at the start of the descent and I eased my way down the very steep hill, reaching the ferry just as it was getting dark. The boat was on the other side of the river and I could overhear the ferryman saying, “He’s probably wondering where he’s going to camp tonight.” He crossed over and brought me over to the east bank. I set up camp just off the road by the ferry landing. Dave, who’s been operating the ferry for 20 years, gave me some water and I was able to wash off my bike using the hose at his work home. My lone companion on the road. Looking down on the Big Bar Ferry. My camp spot by the Big Bar Ferry. The next day began with a long climb out of the Fraser River valley to the Jesmond Road. A few hours and one steep push later, I reached the top and began the long, mostly downhill pedal back to the river. I passed under powerlines and through numerous ranches and a small First Nations community. The mud was still there, but it wasn’t as bad as the previous day. Eventually I reached the Fraser River again – a stunning section where golden fields gave way to huge cliffs over the river. A similar vast landscape was visible on the west bank. A junkyard on the road up from the Big Bar Ferry. Cattle in the OK Corral. The junction. I was heading north but in a few days I would pass by here again to head south. My goal was the Gang Ranch Bridge and its namesake on the west side of the river. The ranch was founded in 1865 and was for a long time the largest in North America. As I climbed the smooth dirt road up to it, I was interrupted by a passing truck. The women, who was the ranch manager, asked if I was lost. When I told her my hope to camp on the ranch, she said I wouldn’t be allowed. Or at least not until I crossed to the other side some 20 kilometres away uphill. Otherwise, I’d have to return to the river. I thought about pushing forward, but given the time, I went with option B and camped on a bench above the river. The skies cleared up and I spent some time stargazing before curling up in my tent. Looking down at the Gang Ranch Bridge. Climbing into the Gang Ranch, before I got turned back. The obligatory lit up tent star shot. I re-started the climb the next day, following the road through a small canyon into the heart of the Gang Ranch. I traced around vast hay fields and grasslands and chased cows along the road. I climbed steadily upward, leaving the ranch onto a flat plateau where I battled a fierce headwind and more mud. The climb was endless, exhausting, and soul-sucking. It took me through featureless pine forests before I finally reached the top and descended onto the Chilcotin Plateau. I rode through more open ranches and had white-tail deer bounce down the road ahead of me. The road widened and improved, and eventually I found myself flying down into Farwell Canyon on the Chilcotin River. Farwell Canyon is known for its hoodoos, freeride mountain biking, and giant sand dune. I reached it at about 4 p.m. and found a perfect camp spot on the river next to some abandoned wooden buildings, the relics of an old homestead. There was a few fire pits dug out, a field of dry grass to use as kindling, and a big deposit of driftwood nearby. I started a fired and relaxed for the rest of the day. My attempt at a selfie while heading down into Farwell Canyon. Thanks for the advice sign! The canyon is home to an abandoned homestead. Day four, and I woke up to more clear skies, I waited for the sun to illuminate the canyon before beginning the long climb up to the next high point. This one was pretty gradual and before long I was cruising downhill towards Highway 20 – the road to William’s Lake. I was pretty exhausted at this point and I was looking forward to returning to civilization and getting a hotel room for the night. One more crossing of the Fraser River, an easy climb, and fast descent later, and I was sitting at an A&W enjoying a Papa Burger combo. I checked into the Ramada Inn across the street, which had a hot tub and buffet breakfast. I bought food for the return leg of the trip, then returned to my hotel room, ordered a pizza and settled in for a night of Arnold Schwarzenegger comedies (Junior and Kindergarten Cop). Climbing out of Farwell Canyon. Cattle graze next to a small lake on the road out of Farwell Canyon. The hoodoos of Farwell Canyon in the early morning light. After a big breakfast, I hit the Dog Creek Road out of William’s Lake, which was paved for the first 30 kilometres. I passed the tiny airport at Springhouse and the pavement ended before I reached the First Nations community of Alkali Lake. There, the non-descript road left the forest and emerged into a beautiful, yellow-green valley centred around its royal blue namesake lake and a sprawling ranch. I then climbed out of the valley and onto the hills above the Fraser River. It was here the mud from the first few days of my trip caught up with me. My bottom bracket, which had been creaking along for the last few days, seized up and pedaling became impossible. I was part way up a climb so I started pushing, with the intention of making it to the top, coasting down the next descent, then finding a place to sleep. I had a few days worth of food and I had seen enough pick-up trucks rocking back and forth that I wasn’t worried about my situation yet. As I walked along, a couple of trucks passed by and stopped. They offered me a ride and took me to the top of the hill, down to the community of Dog Creek, then back to the top of the next hill, where they dropped me off. It was one of the greatest camp spots ever. A band of wild horses roamed as I rolled my bike through an opening in the fence to a flat spot overlooking the Fraser Canyon. The sun lay low in the sky, casting a golden light on the vast grasslands around me. I set up camp, then laid back and relaxed for the rest of the day. I watched the sunset then gazed at the stars. My bike could wait for the morning. Wild horse roam the grasslands above the Fraser. The landscape glows in the evening light. Day six. I woke up and lay in my tent waiting for the sun to crest the ridge behind me and warm up the morning sky. When that didn’t happen right away, I rustled out of my sleeping bag and got out into the cold. I put some water on to boil and set about taking apart my crank to see what was wrong with my bottom bracket. I opened it up and saw little shards of metal fall out. I cleaned it up, put it back together and gave it a spin. It worked, and I was good to go. My crank held up as I pedaled up the same road I had rode down a few days earlier. I turned away from the Fraser River towards the community of Canoe Creek, where I was able to re-fill my water. The ride today was almost entirely uphill, but the grade was gradual and I was making good progress. I reached the junction with the road to the Big Bar Ferry when my crank seized up again. Once again, I took it apart and put it back together, which worked for a while until it didn’t. I coaxed my bike to the top of the climb and coasted down to Kelly Lake, where I camped at a closed provincial park. I gave my bottom bracket one last clean before heading out the next morning. My crank would turn but it wasn’t happy so I pushed up the next hill – a 500 metre climb over five kilometres. I would have hitchhiked but the road was marked as closed and no cars passed me. I worried about snow but I shouldn’t have as the road was dry to the top. I pedaled over the passs, where the forest opened up and revealed stunning views of the Fraser Valley and the snow-capped mountains of the Coast Range beyond. A sign warning of steep grades made me smile as I began the long descent down back to the highway to Lillooet. I had to walk my bike along a couple of flat sections, but otherwise made it back to the pavement pretty quickly. I continued downwards until I hit a hill. I could have kept up a pattern of coasting and pushing but instead I locked my bike to a fence and hitched a ride back to the Reynolds Hotel. The view from the top of the last climb. The ride down to Lilllooet. The ride ended up being just what I hoped for. It took me through a beautiful part of B.C. I’d never seen before. It was also harder than expected, with long climbs made worse by thick mud and mechanical issues. Still, I find these tours are made by the moments that make me smile, and there were many on this trip, especially late on the second day, when the sun came out and stayed out for the rest of the week.